ANKARA, Turkey - A tragic high-speed train crash near the Turkish capital of Ankara left at least nine people dead and dozens more injured on Thursday. 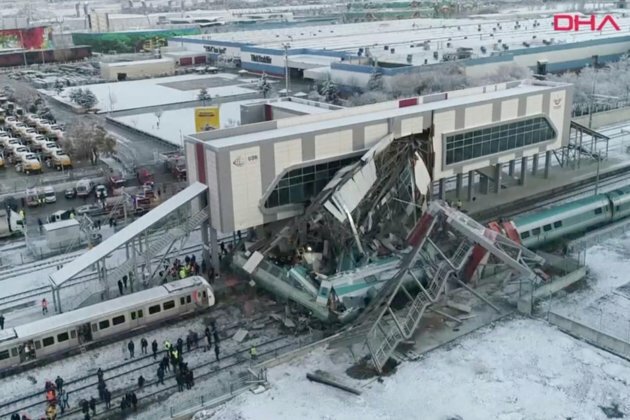 The high-speed train carrying 206 passengers, was traveling from Ankara to the central Turkish city of Konya, when it collided head-on with a maintenance vehicle in Ankara's Marsandiz station. The collision, which took place at around 6.30 am local time on Thursday, minutes after the train left the station, killed nine people and left 47 others injured after the train crashed into a pedestrian overpass at the station. Ankara city Governor, Vasip Sahin told reporters at the site of the crash that dozens of people were injured and that three of them were in a serious condition. Sahin also confirmed the death toll and said, "Our hope is the number of dead does not increase, but our units are working. Once their work is complete, we will be able to share more information." Turkey's state news agency, Anadolu confirmed in its report that 206 passengers were on the train at the time of the crash and three of the dead were train conductors. The agency said that six others that were killed in the incident were passengers. Anadolu added in its report that when the train collided with the maintenance vehicle, it caused part of a bridge to collapse onto two carriages. According to a report in the private NTV television, at least two cars of the train derailed and parts of the overpass collapsed on to the train. So far, officials have not commented on whether a signalling problem or the speed of the train caused the crash. The crash led to a major emergency operation to rescue passengers from the piles of warped metal, wrangled cars and debris. Rescuers at the site of the crash helped move those injured in the crash away from the wreckage. Later in the day, following an inspection of the site, the country's Transport Minister Mehmet Cahit Turhan told reporters that the engine was checking the tracks at the station. According to the Ankara Governor, a technical inspection had begun and three prosecutors were reportedly assigned to investigate the incident. This is the second train accident in Turkey this year. A passenger train derailed in northwestern Turkey in July this year, killing ten people and leaving over 70 others injured. At the time, officials in the country said that torrential rains had caused part of the rail tracks to collapse. In another incident last month, 15 people suffered injuries when a passenger train collided with a freight train in Turkeys Sivas province.